← Is SNOWPIERCER a sequel to WILLY WONKA? 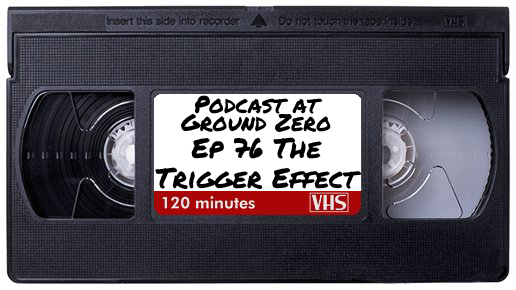 For the 76th episode of Podcast at Ground Zero the topic will be again The Trigger Effect. This week we will be discussing The Trigger Effect an apocalyptic-ish film released in 1996. The film follows the downward spiral of society during a widespread and lengthy power outage in Southern California. The Trigger Effect explores the idea that a simple power outage can potentially trigger a chain of largely unfavorable events, implying that modern society cannot live peacefully together without technology. Another awesome episode of apocalyptic goodness. In defense of the flick, I insist that everyone call me Your Apocalyptic Excellency if the power is out for more than an hour, so I can see where the writers were coming from. Excellent video, gents! Glad to see that the winter-hunger hasn’t ended you yet. Have you guys read Without Warning and After America? Interesting apocalyptic visions of the world after the destruction of America. Might be a good diversion from these shoddy movies.